The problem solving function assists people who are directly, materially, and adversely affected by ADB-assisted projects to find solutions to their problems. It is led by ADB’s Special Project Facilitator (SPF). 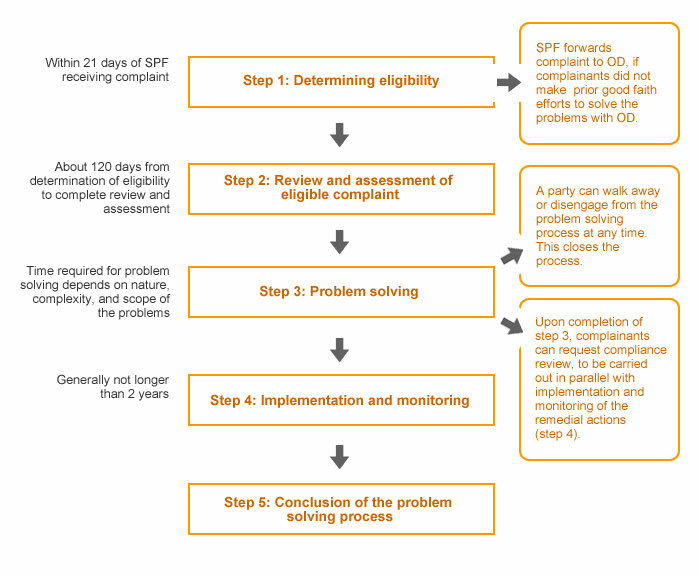 The problem solving function starts with consideration of the eligibility of the complaint. If accepted, the focus will be on seeking agreement among all the parties involved such as the complainant, project implementer, developing member country government or private sector sponsor, and ADB. The Special Project Facilitator will, however, not interfere in the internal matters of a developing member country. The general approaches in the problem solving function include (i) consultative dialogue, (ii) information sharing, (iii) joint fact-finding, and (iv) mediation. The SPF may also suggest various specific approaches to resolve problems, such as convening meetings, organizing and facilitating problem solving processes, or engaging in a fact-finding review of the situation. The problem solving function is outcome driven. It will not focus on the identification and allocation of blame, but on finding ways to address the problems of the project-affected people. The Special Project Facilitator offers an additional avenue for problem solving but does not supplant the project administration and problem solving functions of ADB’s operations departments. He/ she reports directly to the President of ADB and recommends actions to deal with the complaint. He/she will also monitor implementation of agreements resulting from the problem solving process.